UFP Technologies has adapted our case and custom insert solutions to provide presentation cases for sales professionals. UFP Technologies now has the capability to create professional carrying cases for displaying, presenting, protecting and transporting products. UFP Technologies' custom presentation cases provide sales professionals superior protection for their products, organization and the aesthetic appeal needed during important sales meetings. The combination of a large inventory of cases, wide array of foam materials and multiple fabrication capabilities allow for a truly unique solution for each customer. In an effort to showcase a variety of UFP Technologies’ fabrication capabilities at customer meetings, UFP Technologies created a presentation case for use by the sales team. The sales carrying case was designed with multiple pockets of different depths with corporate branding incorporated to the interior. Fabricated foam samples, foams of different densities, sell sheets and personal business cards were all given a perfect fit in their own section of the foam insert. For this demo case two different foam materials were used to balance cost-savings and to maintain its eye-catching appeal. The ‘U’ logo needed to be prominent in the design of the sales case. Using the company colors of blue and white, the top panel was fabricated out of a cross-linked polyethylene foam, which is the most aesthetically pleasing of all foam types. 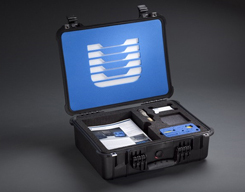 The bottom section of the case that houses samples, literature and business cards was fabricated out of UFP Technologies' proprietary foam material, Case Fit™ 260. Case Fit 260 is a less expensive foam that exhibits superior protection properties while still providing a professional look. Pelican Products, Inc., a protective case manufacturer, called upon UFP Technologies to create a complete case and insert solution to showcase their line of flashlights. 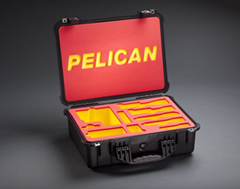 UFP Technologies' engineers worked with members of Pelican Products and designed a two-color foam insert that housed a variety of their flashlights in one of their popular cases models. The colors of the insert, red and yellow, matched their corporate color scheme. UFP Technologies was able to fabricate Pelican Products’ logo in the top panel without comprising any of the protection properties of the case or foam interior. Each pocket of the insert provided a perfect fit for its specific flashlight model. The pockets of the foam interior were also fabricated with a round edge to allow the sales representatives to easily remove each flashlight from its respective pocket when showing their customers.